Riverside’s Irene Winner runs in the 3,200 meter run during a track meet on Friday in Riverside. Winner was first in the 3,200 meter run and first in 300 hurdles. View more photos from Riverside’s track invitational here. DeGRAFF — Riverside hosted five schools in a track invitational on Friday. 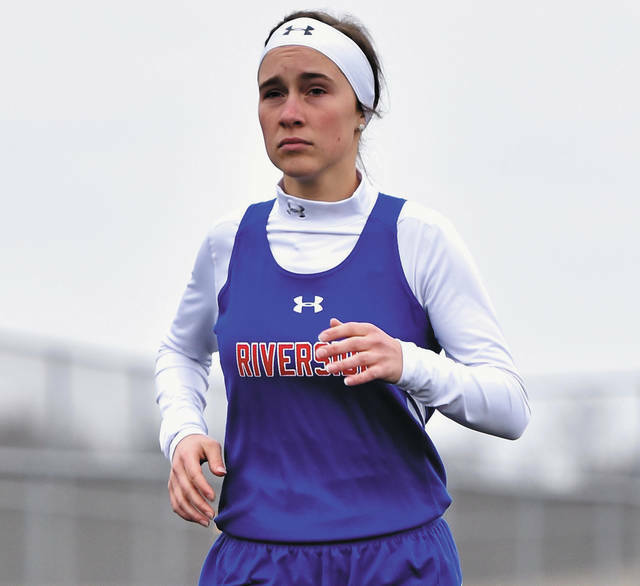 Several athletes on Riverside’s girls squad won events, as did a couple of athletes on the boys squad. Megan Richardson was first in shot put while Lauryn Sanford was first in high jump and Alli Knight was first in pole vault. Irene Winner was first in 300 meter hurdles and first in the 3,200 meter run. The 800 relay of Knight, Winner, Sanford and Alaina Heath was first. Heath finished second in the 100 meter hurdles and Knight was second in the 200 dash. On the boys squad, Jeff Wren finished first in pole vault while the 400 relay of Jaxon Heath, Ethan Jackson, John Zumberger and Kale Long finished first. Jackson was second in long jump while Heath was second in the 400 dash. Riverside’s boys 800 and 1,600 relays finished second. Results with times, heights or distances were not reported. Jackson Center also participated in the invitational. No results were reported. Fort Loramie’s girls squad finished first out of eight schools at Spencerville’s Bearcat Relays on Friday while the boys finished third. The girls finished first with 92 points, just beating second-place Marion Local (89). The 400 relay of Corynn Heitkamp, Abby Wrasman, Jenna Fischkelta and Alyssa Wrasman finished first in 1:06 while the 1,600 relay of Anna Detrick, Erin Chaney, Chloe Stang and Kennedi Gephart finished first in 4:17. The 400 relay of Morgan Eilerman, Jordyn Koverman, Cara Meyer and Hannah Siegel was first in 1:01 and the 3,200 relay of Detrick, Olivia Borchers, Kaitlyn Grillot and Heitkamp was first in 10:33. Heitkamp and Abby Wrasman tied for first in high jump by clearing 4-10. The boys were third with 81 points. Columbus Grove was first with 116. The 1,600 relay of Joe Ballas, Colten Gasson, Collin Gasson and Jake Rethman finished first in 19:35. The same four also made up the 3,200 relay and finished first in 8:41. The distance medley of Ballas, Beltron Dorado, Evan Luthman and Jake Rethman was first in 8:40. Collin Detrick was first in the discus with a throw of 143-2 and Charles Wray was first in pole vault by clearing 12-6. A no-hitter by Sidney pitcher Ryan Caufield wasn’t enough to lift the team to victory on Friday in Xenia. Sidney scored one run in the top of the sixth to take a 2-1 lead but the Buccaneers scored two runs in the bottom half and held the Yellow Jackets scoreless in the seventh to win a Greater Western Ohio Conference crossover game. Sidney scored in the sixth when Kaden Walker hit a two-out single to center field to score one run. The Yellow Jackets had three errors in the bottom half of the inning, though, which allowed Xenia to score two runs without getting a hit. Sidney had runners on second and first in the seventh but didn’t score. Sidney had five hits and four errors. The Buccaneers had one error. Caufield was charged with the loss. He allowed one earned run on five walks and had one strikeout in six innings. Ben Spangler was 2 for 3 for at the plate. Justin Tenkman threw a no-hitter to lift the Cardinals to a nonconference victory on Friday in New Bremen. New Bremen had seven hits and no errors. Jackson Center had two errors. Tenkman had six strikeouts and allowed one walk in seven innings. Christopher Elchert picked up the loss for Jackson Center. He allowed three earned runs in six innings with two strikeouts and one walk. Patrick Wells hit a three-run home run for New Bremen in the sixth. He was 3 for 3 on the night. Grant Selby was 2 for 3 with 1 RBI. Mitchell Hays had a double. Fairlawn fell behind early and couldn’t catch up in a home nonconference game on Friday. Franklin-Monroe had 14 hits and one error while Fairlawn had three hits and two errors. Doug Wright was charged with the loss for Fairlawn. He gave up five earned runs on nine hits in four innings and had three strikeouts and one walk. Jordan Lessing had a two-run double for Fairlawn while Skyler Piper and Noah Krebs each had a stolen base. The Wildcats gave up three runs in the sixth inning and couldn’t recover in a road nonconference game on Friday. Fort Recovery had seven hits and no errors while Houston had seven hits and three errors. The Wildcats scored two runs on three hits and a walk in the fifth to take a 3-1 lead but gave up three hits and committed two errors in the costly sixth inning. John Leist was charged with the loss. He pitched six innings and gave up one earned run. He had three strikeouts and three walks. Leist was 2 for 4 at the plate while Howie Ludwig was 2 for 2 (including a double) with 2 RBIs. Jacob Vetter drew a walk for the Tigers. The Tigers scored three runs in the sixth inning to earn a run-rule victory in a nonconference game at Wright State’s Nischwitz Stadium on Friday. Versailles had 12 hits and no errors while Miami East had two hits and three errors. Andrew DeMange was 3 for 3 with 1 RBI while Kyle Pothast was 2 for 3 with 1 RBI and two runs. Zach Griesdorn was 2 for 2 with 2 RBIs and two runs and Will Eversole was 2 for 4 with 2 RBIs. Pothast and Garrett Toops each had a triple. Mathew Niekamp pitched a complete game and had two strikeouts and four walks. The Yellow Jackets earned a victory in a Greater Western Ohio Conference American North Division game on Friday in Xenia. Naida Stephens had a big game. She was 2 for 4 at the plate, with her hits being a solo home run and a triple. She also had a big game defensively and made five putouts in center field. Hallie Westerbeck was 2 for 4 with one run while Jenna Smith was 2 for 3. Lauren Barker picked up the win in the circle. She had two strikeouts and two walks and also batted in a run at the plate. Minster scored 10 runs in the second inning to blow open a run-rule victory in a home nonconference game on Friday. Minster had 15 hits and no errors while Houston had six hits and three errors. Jenna Poeppelman picked up the win in the circle for Minster. She allowed one earned run and had six strikeouts with one walk in five innings. Karly Richard hit two home runs for Minster. She was 3 for 3 with a walk. She had 3 RBIs and scored four runs. Taylor Homan was 3 for 4 with 3 RBIs and two runs. Danielle Barhorst was 2 for 4 and Poeppelman was 2 for 3. Homan and Emily Stubbs both had a double. Peyton New was charged with the loss for Houston. She allowed three earned runs on seven hits in 1 2/3 innings. Allisen Foster was 2 for 2 and had a walk for Houston. Emilee Foster had a double. The Cardinals scored nine runs in the fourth inning to close out a nonconference win on Friday in New Bremen. The Cardinals had 13 hits and two errors while Jackson Center had four hits and two errors. Molly Smith was 3 for 3 with 2 RBIs for New Bremen. Hannah Tenkman, Kira Bertke and Kelly Naylor each had two hits. Taylor Paul hit a home run and Tenkman hit a triple. Abbi Thieman had four stolen bases while Taylor and Smith each had three. Erin Smith picked up the win in the circle. She allowed three hits in three innings with one strikeout and three walks. Kenleigh Fortner was charged with the loss. She allowed nine earned runs. Jackson Center leadoff hitter Ashley Mullenhour was 2 for 2 with one walk. She had a double. The Redskins’ couldn’t overcome 11 errors in a nonconference game on Friday in Fort Loramie. Fort Recovery had 15 hits and five errors. Loramie had 10 hits. The Indians scored five runs in the third to break a 2-2 tie and led the rest of the way. Aleah Frilling was charged with the loss in the circle. She allowed two earned runs on seven hits in 3 1/3 innings and had six strikeouts. Desiree’ Fogt was 2 for 3 for Fort Loramie while Macy Imwalle was 2 for 4 with 2 RBIs. Aubrey Baker was 2 for 3 with 3 RBIs. Fogt, Baker, Aleah Frilling and Katelyn DeLoye each hit one double. Franklin-Monroe scored 11 runs in the first inning to run away from Fairlawn early in a run-rule win on Friday. Franklin-Monroe had 12 hits and no errors while Fairlawn had three hits and two errors. Allison Roush was charged with the loss for Fairlawn. She gave up eight earned runs on 11 hits and seven walks in 3 1/3 innings. Alexia Graves was 2 for 2 for Fairlawn with a triple. She scored the team’s run. The Vikings scored eight runs in the third inning to run away from Versailles in a nonconference game on Friday in Casstown. They scored two runs in the sixth inning to end the game with a run-rule margin. Versailles committed 11 errors and had five hits. Miami East had seven hits and no errors. Tara Fritscher was charged with the loss. She allowed three earned runs on four hits in three innings and had one strikeout and five walks. Fritscher hit a home run and had a double. Elli Morris also hit a double.